Our main goal in this ministry is to provide for you the most wonderful, beautiful, honorable, and memorable celebration possible. We really do care about you and want to anything possible for you in a difficult time. Our main goal in this ministry is to provide for you the most wonderful, beautiful, honorable, and memorable celebration possible. We really do care about you and never would want to be considered a “business”. We are proud to announce that we have just received a very important award from The City of Long Beach: The 2017 Best of Long Beach Award for Funeral Services & Cemeteries. We are also very proud to announce that we achieved USCG certification for carrying passengers on board. This is extremely significant for the general public for with us, you know that we are legal and safe. Many illegal businesses are operating (and getting caught). They endanger your life only to save the costs of becoming a legal entity and a USCG certified vessel. As you begin to view our web site, I ask you to read some of the letters we get. These comments that we get weekly come from the hearts of those that we have met. It is hard to describe what a blessing it is to receive these testimonials. We believe so strongly in honesty, transparency, and in giving. We are not a charter boat company or a commercial business. We are a non-profit public benefit charitable trust operating out of our office-5150 PCH, Suite 200 in Long Beach. You may notice in your search for the service that pleases you the most, that we are very unusual: we do not have additional charges which everyone else does, we do not charge more for weekends or holidays, we do not have a specific destination or a specific time of day we go out for we want you to be a part of the decision-making process and want to do everything at your convenience. We have even arranged for free parking for you and your guests at Rainbow Harbor. For larger parties , more than 12 passengers, we can arrange for all of your guests to be a part of the ceremony at no extra cost. Our boat is located in beautiful Rainbow Harbor, the Shoreline Village area in Long Beach. More specifically, we are near Parker’s Lighthouse whose address is 435 Shoreline Village Drive, LB 90802. We are United Coast Guard certified to carry 12 passengers. Many other companies are uninspected vessels, meaning they have not been inspected by the USCG, and are only allowed to carry 6 passengers. Their captain has a license called a 6-pack unlike our captain who has a much higher qualification as a Master Mariner Captain. Our vessel has also had to meet much higher standards to make her safer for the passengers. We would also like to announce that on March 17th we received the award from a very prestigious organization based in New York City for “The Best Burial Service of 2016/2017. Now that came as quite a surprise and I would not go so far as to say that we deserved it. We try our best and know that we are far and above better than all of the services in our area and have been told this many times. We are humbled and extremely gracious of this honor. The Last Watch was created to honor our Military Heroes and their families. The Owner and President, Pat O’Connor is a Viet Nam veteran who served our great country as a leader of Green Beret units through the U.S. Army Airborne Special Forces. He wanted to ‘give back’ so established a special Military Burial service with the scattering of ashes at sea for all Military branches and their families. We have learned that we are the only organization in the United States to honor our service members in this way. We were awarded through the state of California the status of a non-profit, public service, charitable trust by the Attorney General, Secretary of State and the Department of Consumer affairs. We are so blessed to be able to help so many families in their time of great need. It is also a great blessing to be able to serve our country by helping all members and families of the Military. Pat’s father was a communications officer in the Merchant Marines during WW 2. He also taught at the Merchant Marine Academy at King’s Point, Long Island. For generations, many members of his family have proudly served. Let us be honored by calling us in such a difficult time such as the loss of a loved one. We can arrange for a full Honor Guard Ceremony if you desire. The ceremony includes a 21 gun salute (riffle volley), the playing of taps by a bugler, and the flag folding ceremony. This concludes with the presentation of the flag to the closest family member. As a gift to you, we have a Professional Photographer record this event. Arrangements can also be made for a live broadcast of this ceremony along with the burial ceremony. This is extremely popular for those that cannot attend. After this ceremony, we will board our boat with you as our guests or meet you at a pier for the loving and honorable scattering of ashes. This is followed by the ringing of the ship’s bell (Eight Bells) signifying ‘The Last Watch’ by the deceased for our gracious country before returning to port. The Honor Guard Ceremony takes about 30 minutes. It is performed in a designated park in Long Beach prior to the burial ceremony. 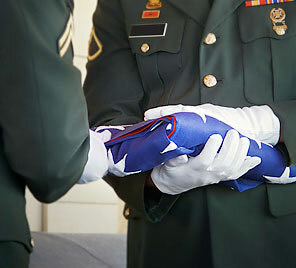 When you call us to arrange for a Military funeral, all details will be put in place and the Honor Guard contacted by us. We then put you in touch with the head of the Honor Guard as they work out the details with you. We are often asked, “What does this cost? The Honor Guard Ceremony is absolutely free through us. Even the 9’burial flag (coffin flag) is free. Donations of any amount to the Honor Guard go directly for their expenses of uniforms, ammunition, and weapons. A ‘typical ‘donation to them is usually around $100. The Honor Guard service goes like this: They march in following the Bugler. As he positions himself, they continue to march to a spot where all of you are standing. On command, they fire the 21 gun salute (riffle volley) .The Bugler then plays ‘Taps’. The final part is the flag folding ceremony with the presentation of the United States flag to the closest of kin. We have seen some families add flowers, music, and pictures displayed at the park. It is such a dignified and loving way to honor the hero in your life. All of this is supported by donations that extend to helping another military family. Donations cover our costs and range from $500 to $800 depending on the number of guests and location. We strongly recommend Long Beach as the best and least expensive of options. For the State of California, the Secretary of State and Attorney General, Department of Justice, and Department of Consumer Affairs have awarded a non-profit, public benefit, charitable trust designation to The Last Watch Foundation to provide funeral services to help the Military and their families. We are the only organization in the United States to be awarded this honor. The State has also given us license to perform the scattering of ashes at sea. If a donation to The Last Watch is ever received, those funds are deposited directly into The Last Watch Foundation. The yacht ‘Orion’ is our private boat taken care of and maintained by our family. Our basic philosophy is that each week, she may be a week older, but she’s also a week nicer. We take great pride in her and want her not only to be a great boat for us, but also a wonderful and beautiful boat for you and your party basically as a ‘back drop’ for the burial service. Well taken care of, she also will provide for you the ‘comfort’ that a ceremony would not have to be cancelled because she was not running.